Bazaars' focus has previously mainly been on correctness and features. The first has always been one of our strengths, and we're in pretty good shape regarding the second. Performance has been one of the main complaints from users about Bazaar and so we have recently tried to improve in that area. Since 0.12, we have already tried to optimise some of the common code paths and some people have been working on a high performance smart server (to speed up remote operations). During the first two-and-a-half days of the sprint, we analysed 20 of the most common use cases with Bazaar and determined what complexity they should ideally require to be able to work. After this analysis, we looked at ways to change our data structures to reach these goals. I have mainly been a spectator during the latter parts of these discussion, but they were interesting to follow. One of the things I worked on was support for true push in bzr-svn. This was one of the bugs that has bitten a lot of users of bzr-svn. The upcoming bzr-svn 0.4 now supports true push as well as commits in heavyweight checkouts. I hope to release 0.4 after adding nested tree and ignores support so that I don't have to change the internal mapping mechanisms again. And now, it is time for some more sightseeing. After that I hope to get back to the reason I'm doing all of this in the first place: Samba! John Goerzen has been evaluating various version control systems and his blogs posts on the subject have been interesting. One of the most interesting points he raises about Bazaar is that there is no "darcs send"-like support. The "submit" plugin gets close, but I think it misses some important features - and I agree it should be part of the core. I'm not sure that the merge support in Bazaar is worse than that in Mercurial or Git. I've never had problems with it, and I use it a lot. Performance, other than remote access, is also no longer a problem for medium size projects as of 0.15. Update: it's no longer as much of a problem as it used to be. Remote access is still significantly slower than it can be, but people are working hard on fixing that problem. It's also interesting to see that the Bazaar user interface and documentation is apparently confusing to people who are mostly familiar with other distributed version control systems rather than centralized systems. We definitely need to work on that. The fact that John doesn't come from CVS or Subversion also explains that checkouts don't appeal to him. As of 0.15, Bazaar will have initial support for nested trees. Nested trees basically allow you to add a 'magic' directory to a Bazaar branch that in itself is another Bazaar branch. A very good use case of this is if you have a project for which you need to include some library (e.g. popt). Nested trees allow you to add a reference to the upstream popt branch, avoiding the need to synchronize every time upstream fixes a bug. Subversion has similar functionality, although the term used there is 'externals'. Externals are quite easy to use - using them only requires setting the svn:externals property. I've done some early work on supporting externals in bzr-svn and mapping them to nested trees. At the moment, bzr-svn is able to track nested trees that are being added. Removes and changes to existing nested tree locations are still on my todo list, but will definitely be supported in bzr-svn 0.4.0. Since I've upgraded serendipity to version 1.1, it seems to keep losing my draft blog entries (either that, or hiding them somewhere I can't find them). For that reason, this blog post is a bit short, as I'm too lazy to rewrite the original one I had drafted up. Bazaar 0.15 is promising to be a really great release. Several new features are going to land: dirstate (fast working tree access), tags and initial nested tree support. Martin sent a merge request for tags this morning. W00t! Another point off my list of wishlist items. Now that I have some more time to spend, I've done some more work on Samba 3 and 4. In particular, I've resolved a couple of pending DCE/RPC issues. I'm now looking at improving the test runner a bit, so that it shows progress. 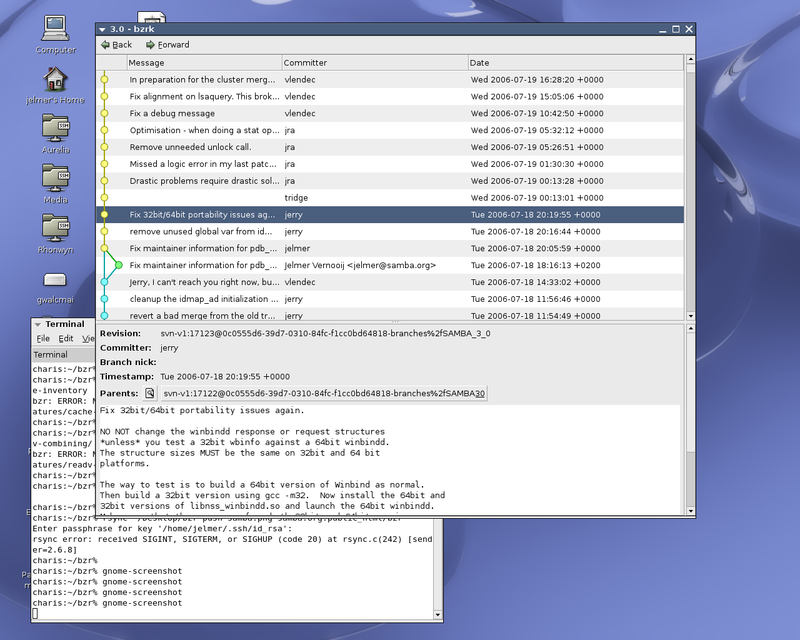 I released bzr-svn 0.3 a couple of days ago, a couple of hours after the first release candidate for Bazaar 0.14. The main focus has been on reducing the number of bugs. That's resulted in a large number of repositories now working with bzr-svn. 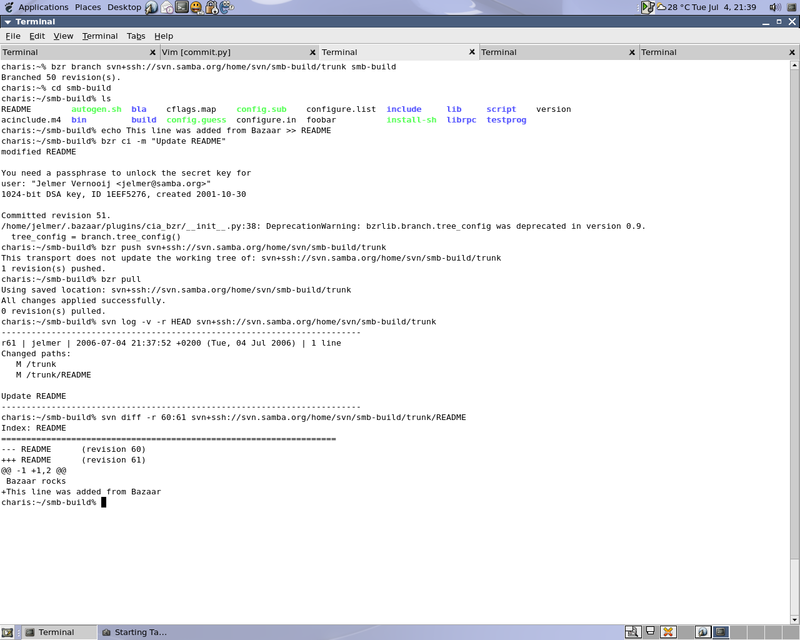 In fact, all of the repositories I've tested so far work. It's going to be another Bazaar-heavy week next week at the Bazaar sprint Wouter and I are organizing in Amsterdam. The Bazaar PQM has just merged my first Bazaar commits. Hopefully there are more to follow in the near future. I also managed to fixed some more annoying bzr-svn bugs today, 0.2 is nearer than ever now. At last, I've started to use bzr-svn in production. I'm now working on Samba in bzr, pulling from and pushing to Subversion branches as if they were native Bazaar branches. It seems to work quite well. Bazaar can be slow dealing with large history, but that appears to be a temporary issue rather than a design flaw. I've also published conversions of the two main Samba branches on the web at http://people.samba.org/bzr/jelmer/samba/. Now, time to get the Subversion Python fixes into all the distro packages. charis:~/bzr/hg-bzr-svn/hg-branch% hg ci -m "Add afile"
charis:~/smb-build% bzr ci -m "Update README"
Get Ubuntu bug #51304 fixed (integrate Subversion fixes into package). For the plugin, I've had to make quite a few changes to the Python bindings to Subversion. I recently became partial committer to Subversion. My patches are listed by the contribulyzer and commits in the archives. It's been fun working with the Subversion developers. It's been a fun week. I visited the Bazaar sprint in London with LarstIQ and had a great time meeting the core developers. Especially the pair-programming and test driven development was very interesting; the number of lines of code I wrote was smaller than usual, but I have never spent so little time debugging. 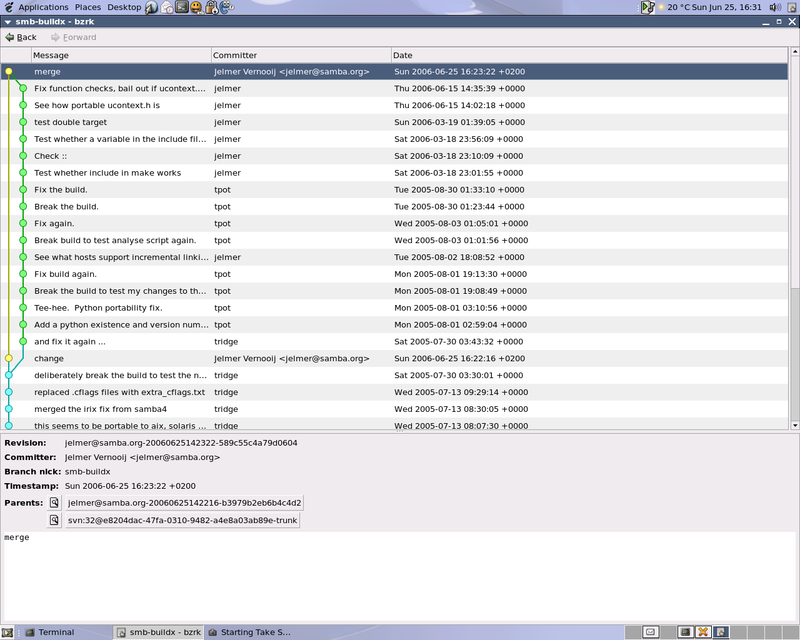 Among the things I worked on were Commit Builder with Robert and some more work on bzr-svn. The Arrow Rock festival yesterday was great. I was a little skeptical about Porcupine Tree's live performance, but I was very pleasantly surprised. Roger Waters' show was shorter than announced (3 hours) but very good nonetheless. Queensryche was the only disappointment - they played only a few old songs and their sound was pretty bad (at least from where I was standing). In the past one-and-a-half week, the discussion about Bazaars' Summer of Code projects, in particular the graphical user interfaces, sparked some interest in nautilus integration, which was originally an unfinished proof-of-concept I wrote a couple of months back. Jeff Bailey picked it up and then contributed some more code as well. The endresult is that we now have very basic nautilus integration, a bit like TortoiseSVN for Subversion in Window Explorer. We've also bundled some of the existing GTK+ plugins such as bzrk and gannotate into one plugin, bzr-gtk, in the hopes of making maintainance easier. Hopefully the Summer of Code student that was going to work on this will be able to continue with these two projects.